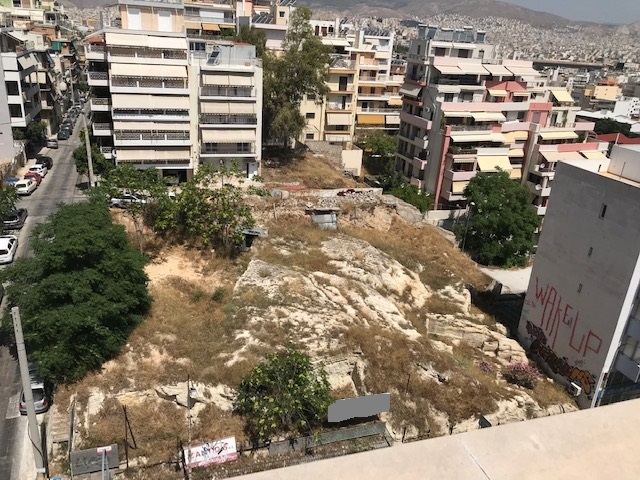 1,163 m² land plot in Piraeus near Faliro Delta suitable for retail and residential development of 4,190 m² total above ground building area. The property is located at Grigoriou Lambraki St. in the center of Piraeus. It features facades on three roads; Gr. Lambraki St., Distomou St. and Odyssea Androutsou St.. Grigoriou Lambraki is one of the main road axis of Piraeus city and connects Zeas marina or “Passalimani” with the area of Faliro and the coastal avenue Leoforos Posidonos, the main road axis of the southern suburbs of Athens. The property is located at 900 m approximately from Korai Square, the focal point of Piraeus city and the new metro station which is under construction. Moreover, it is located about 1,2 km to the west of Faliro metro station (ISAP) and the broader area of Faliro Delta where a major redevelopment project takes place. The new infrastructure works includes a seaside coastal metropolitan park of 22 hectares. Area zoning is “General Residence” meaning that it allows among others development of residences, offices, retail stores, supermarkets of up to 1,500 m², hotels with a total capacity of up to 150 beds and parking stations. The building regulations applied are building coefficient of 3.6 and maximum coverage ratio of land (building's footprint on land) of 60% meaning that the future building can have an above ground building area of 4,190 m² approximately and a footprint (ground floor area) of 700 m² approximately. Vendors had applied for a building permit which granted in 2006 but they did not proceed to the development. The permit has not been in force yet but all architectural plans and certificates already issued are available for interested parties. The building permit file includes approval for development by the Archaeological Agency of the Ministry of Culture since all archaeological assessments have been completed in the said site during the building permit application procedure in 2006. The latter is considered as a key advantage of the subject property since Piraeus is an area of archaeological interest and new developments are subject to controls. Thus the future developer or investor will not have to deal with delays and additional costs due to pending and mandatory archaeological investigations. Atria Property Services acts as the exclusive sale agent of the property. DISCLAIMER 2018 Atria Property Services (Atria). Atria (and joint agent) for itself and for the vendor/lessor as agents for the vendor/lessor give notice that: 1. We provide the information contained in these particulars for guidance to intending purchasers, licensees or any other third parties and they are for your general information only and will be used at your own risk. 2. We will use all reasonable endeavours to ensure the accuracy of information, however, we do not guarantee or warrant the accuracy or completeness, factual correctness or reliability of any information in the particulars (especially as the information may have been obtained from third parties) and do not accept any liability for any errors or omission including any inaccuracies or typographical errors. 3. Any interested purchasers, licensees or any other third parties should not view the information in the particulars as statements or representations of fact and should satisfy themselves that the facts and specific details in the particulars are correct and accurate. Address 24-26 Gr. Lambraki St., Distomou St. & Androutsou St.